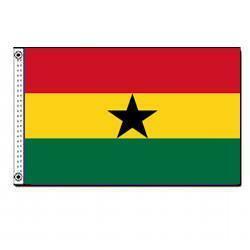 Ghana’s flag was adopted in 1957. Ghana was the first country after Ethiopia to use the Pan-African colors for its flag. The black star was adopted from Marcus Garvey’s shipping line, the Black Star Line, and symbolizes African freedom. Red represents the blood of those who died fighting for independence, yellow stands for mineral wealth, and green represents Ghana’s forests and natural wealth.